ANAHEIM, CA - (May 17, 2015) - Anaheim Mayor Tom Tait and Chicago Mayor Rahm Emanuel agreed to a friendly wager as the Anaheim Ducks and Chicago Blackhawks open the Western Conference Finals of the 2015 Stanley Cup Playoffs today at Honda Center. The friendly wager will include an exchange of food and beverage, plus a contribution to a local charity. ACT Anaheim is Mayor Tait’s choice, and Becoming A Man (BAM), an organization for at-risk young men in grades 7 through 12, is Mayor Emanuel’s choice. “I am excited to take part in this wager with our friends from the west. I have absolute confidence that our Blackhawks will take series. In the unlikely case that things don't go our way, I am prepared to send some craft beer from Slap Shot Brewing Co., a barrel of Chicago’s own Garett’s Popcorn, and some neon green relish from Vienna Beef for a true Chicago-style hot dog," said Mayor Emanuel. The Ducks and Blackhawks open the Western Conference Finals today, Sunday, May 18 at 12 p.m., at Honda Center. This marks the first time the two clubs have faced each other in the Stanley Cup Playoffs. 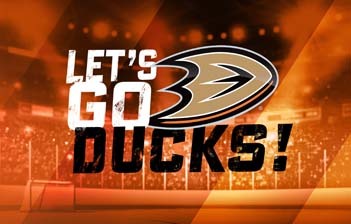 For more information on the Anaheim Ducks, please visit www.anaheimducks.com.